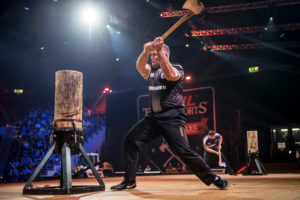 The TIMBERSPORTS® World Championship is held every year in autumn, and sees the best athletes from around the world taking each other on in the original extreme sport. And this year, for the first time ever, this exciting spectacle is taking place in Great Britain at the Echo Arena Liverpool on 19 and 20 October. 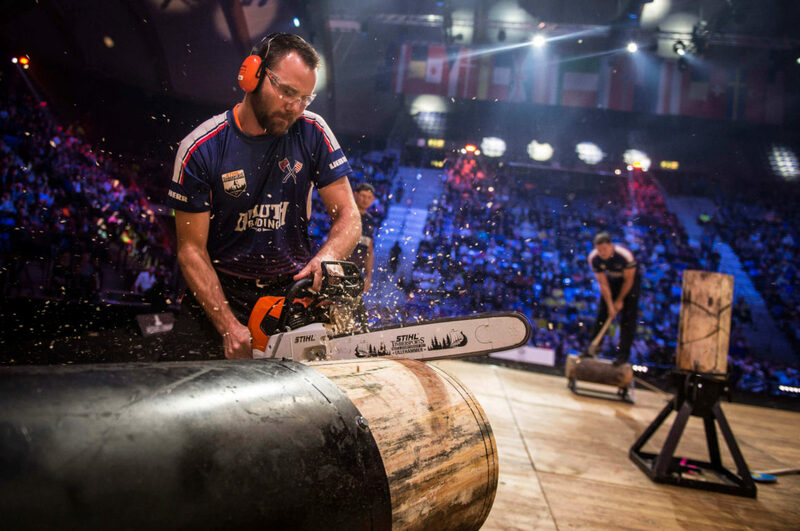 But what can you expect to see at a TIMBERSPORTS® World Championship? Well, let’s start with the team event. Taking place on the Friday night, the team event is a knock-out competition. Each country has a four-man team that complete four of the TIMBERSPORTS® disciplines in a relay head to head with another team. 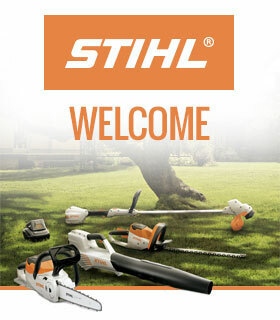 The first man in the team takes on the Stock Saw, using a STIHL MS 661 C-M chainsaw. As soon as he has finished, the next team member starts the Underhand Chop discipline, closely followed by the third man on the 2-metre long Single Buck saw. Finally, the last discipline in the relay is the Standing Block Chop. Each man in the team must complete their discipline in the quickest possible time but they must be careful not to start before their team mate finishes the previous discipline – any jumping the gun means the team get a time penalty. And when seconds count, this can mean the difference between going through to the next round or not, as Australia found out to their detriment in the 2017 World Championship, when a 15-second time penalty meant they lost out to Poland in the semi-final and were unable to defend their 2016 World Championship title. Team GB will be looking to improve on their 16th place finish from 2017 this year and with the event on home soil, they are hoping that the support from the crowd will carry them through the heats. The stage is then set on Saturday, ready for the Individual World Championship, where the fastest 12 athletes from around the world take each other on for the ultimate title. 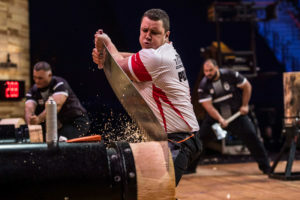 The qualification times are based on the overall times recorded in the national TIMBERSPORTS® Championships that take place around the world. 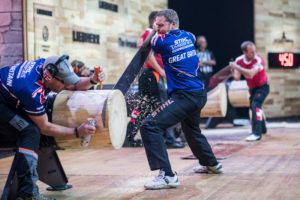 Great Britain’s representative, Elgan Pugh, recorded a respectable time of 2.43:48 minutes for all six TIMBERSPORTS® disciplines at the British TIMBERSPORTS® Championship in August, but he will be training even harder in the run-up to the World Championship. “I try to do a combination of both cardio and weight training, as well as actually practising the disciplines, but I’ll probably need to up my calorie intake with the extra training I’ll be doing” said Elgan when we caught up with him after the British competition. 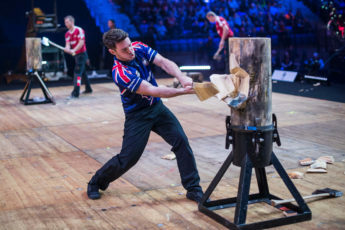 At the World Championship, the 12 competitors take each other on in three disciplines first, the Underhand Chop, the Stock Saw and the Standing Block Chop, accumulating points based on how quickly they complete each event. The fastest time earns the athlete 12 points whilst the slowest time earns the athlete 1 point. Any disqualifications leave the competitor with no points for that round so getting points on the board is absolutely essential. The bottom four competitors after the first three disciplines won’t proceed to the next round, whilst the top eight get the chance to show their mettle on the Single Buck and the Springboard disciplines, earning more points in each round. After these two events, another two athletes are cut from the competition with the top six taking on the mighty Hot Saw as the pinnacle of the Championship. The Hot Saw is a specially tuned chainsaw, weighing around 27 kg, with a chain speed of 240 km/h, and only the best of the best get the chance to show off their skills with this beast of a saw. 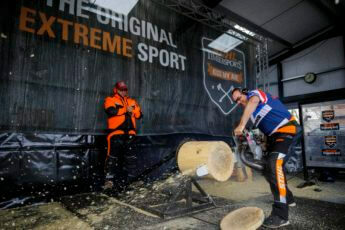 And even the most experienced athletes can fall victim to the power of the Hot Saw as demonstrated by Martin Komarek of the Czech Republic in 2017, when the chain on his saw broke in the middle of his heat. With a time limit of 3 minutes to complete the discipline, Komarek ran off-stage to get a replacement chain and frantically tried to fit it in the time frame. 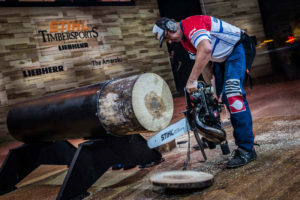 Unfortunately, the clock ran down before he could finish leaving him in 5th place overall, whilst TIMBERSPORTS® legend, Jason Wynyard, took the title for the ninth time! Will he secure his 10th World Championship in Liverpool? Get your tickets today to find out!